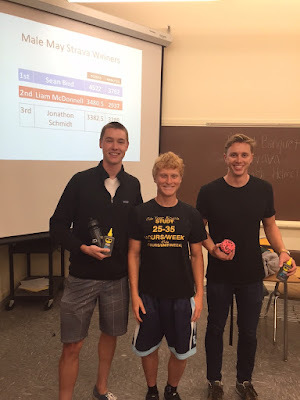 At its most recent Wednesday evening meeting, the Cal Poly San Luis Obispo Wheelmen cycling team crowned its May Strava Champions. Julia Mace and Sean Bird were the official champions, for the female and male categories. 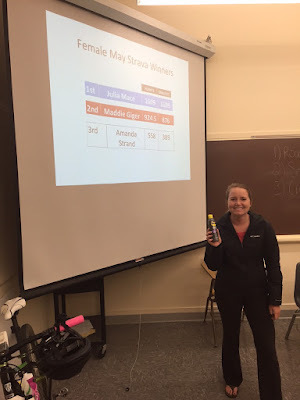 Madison Giger, with her WD-40 award. From left to right: Sean Bird, Jonathan Schmidt, and Liam McDonnell. Cal Poly Wheelmen sponsor WD-40 generously provided awards, from its cycling specific line, which includes cleaning agents and lubricants. During the month of May, participating Wheelmen members tallied over 23 days of collective ride time! 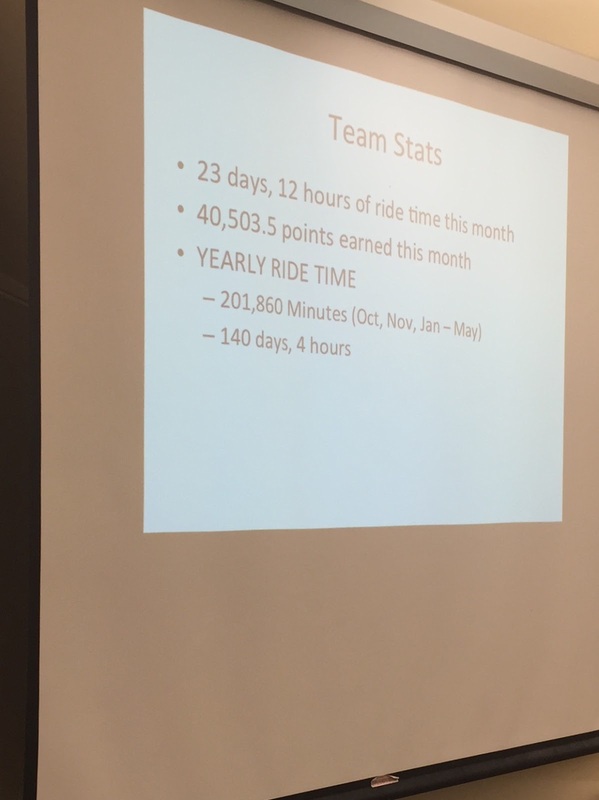 For the academic year, which includes October, November, and January through May, Cal Poly Wheelmen members completed over 140 days of ride time. Super! Cal Poly Wheelmen ride statistics. The Wheelmen Strava challenge was a new concept for the 2014-15 academic school year. It encouraged cycling, both on a social and competitive basis. Riders were awarded points for ride time, group riding, and racing. Both group riding and racing provided extra points. Thank you to Wheelmen President Hank Mandsager for tallying ride statistics, throughout the entire school year.